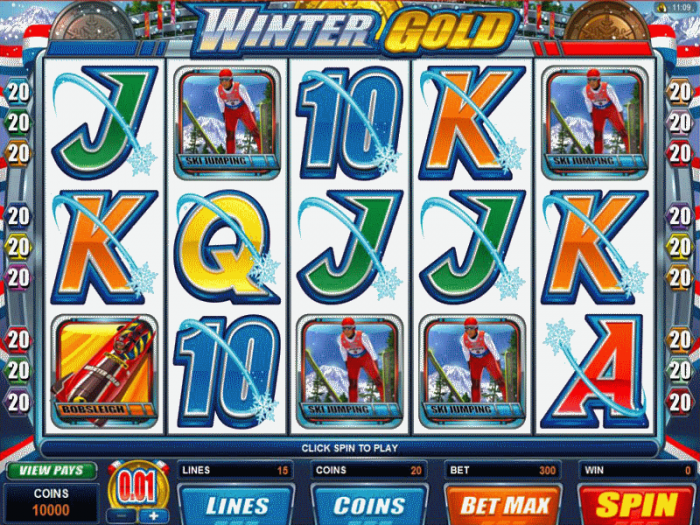 Winter Gold is a thrilling 5 reel casino game that has 15 paylines. You can find it at top casinos such as Platinum Play, All Slots, Royal Vegas, Vega Palms and the 7 Sultans. It is a beautiful and exciting game with a winter Olympics theme. It depicts events from the winter games such as ski jumping, bob sleighing, the biathlon and speed skating. Players can expect to see breathtaking animation of skating rinks cheering crowds, gold medals and snowcapped mountains. Snowflakes gracefully dance on the ten, jack, queen, king and ace. There are also snowy mountains on the backdrop of this visually appealing game. The animation is crisp colorful and highlights the magic of the winter Olympics perfectly. The athletes of each winter event look like they are actually on a snowy mountainside because of the many views and angles. Every last one of the animations features falling snow. Winter Gold is powered by Microgaming. This is one of the most reputable and trusted casino software packages in the world. Players can adjust the settings and change to expert mode. Microgaming also makes it possible for players to look at their detailed statistics and come up with improved betting strategies. Players have provided positive reviews about Winter Gold. They say that it is simple to understand, and that it has wonderful options for betting. You can play up to 20 coins per payline, and there are 15 paylines. Get 5 like symbols on the same payline, and you will be rewarded with 60 to 5000 credits, depending on the symbol. However, it is suggested that you play all 15 paylines in order to get the best payouts. This game does not have a gamble game, which is a feature that many gamers look forward to. This is one of the main dislikes about the game. But the game is still a lot of fun to play. The wild symbol in Winter Gold is the Winter Gold Logo; however, it does not trigger multiple payouts. The gold medal is the scatter and bonus symbol. Get two or more scatter symbols and get a payout. Get three or more scatter symbols and this will activate the bonus wheel feature, which can be seen on the second screen. The Bonus Wheel has eight slots. Two of these slots have 20 additional free spins. Another two slots could result in 18,000 additional credits. The last four slots will get you to a well sought after bonus game. Many people might not like this game because it lacks a progressive jackpot. It has fixed jackpots, but the payouts are low. High rollers may find this game boring because the maximum bet is 60. However, if you get five Winter Gold Logo symbols on the payline, this pays 5000 credits. The second highest jackpot pays 1250 coins if you get 5 bob sleigh symbols all on the same payline. Winter Gold is a beautifully appealing casino game with a lot of dazzling animation. Although it may not have some of the highest payouts around, it is still a very fun game to play.